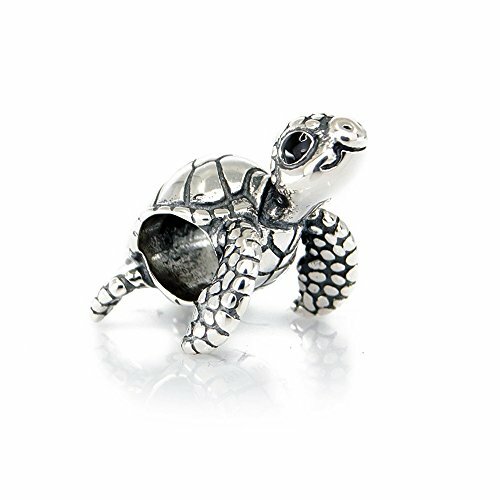 Original Aurora Charm Bead - Turtle Happy Sterling Silver Charm from exclusive Cute & Cuddly Collection. This Sea Turtle charm is on a very special mission to raise awareness about the pollution of our environment, specifically the waste in the ocean. Plastic and other waste dumped into the ocean is causing harm to all the sea animals, micro-pieces of plastic and chemicals in it enter their body and through them it enters our food chain and has huge negative impact also on our own health. Many diseases are caused by these chemicals accumulating in our body over time. Wearing this Turtle charm is set to inspire you to do something positive, for example lower the plastic use and therefore plastic waste today! Charm is hand finished and made from top quality materials: solid sterling silver 925 and black enamel. Charm comes in branded Aurora gift pouch. All Aurora Charms are fully compatible with similar core size charm bracelets like Pandora, Chamilia etc. If you have any questions about this product by Aurora Charm & Unique Beach Jewellery, contact us by completing and submitting the form below. If you are looking for a specif part number, please include it with your message.